George R.R. Martin is an American author, who has been writing Science Fiction, Fantasy and Horror novels and short stories since the 1970s, he is best known for his epic Fantasy series “A Song Of Ice And Fire”, begun in 1996 and currently unfinished. “A Song Of Ice And Fire” is a work of impressive scope, even in its unfinished state. With over ten main characters and a supporting cast numbering in the hundreds (or possibly thousands), as well as a fully detailed and convincing (and relatively original) world, its size and complexity is noteworthy, even in the Epic Fantasy market where such qualities are traditional. It is set in a world which is in a state roughly comparable to England around about the time of the War of the Roses, with the addition of a few fantastical elements such as a climate where Summers or Winters can last for years and a small amount of magic (although there's a lot less magic than in many Fantasy worlds, especially at the start of the series). Most of the series is set in the continent of Westeros, a land ruled by a single king, but which comprises the remnants of seven different nations united several centuries before. Most of the main characters come from four of the main noble families that dominate the continent – the Starks, Lannisters, Targarayens and Baratheons. The Targarayens had been in power for several centuries after conquering all the existing Seven Kingdoms with the help of the devastating effect of their King’s three dragons on enemy armies. A dozen years before the start of “A Game Of Thrones” they were deposed in a rebellion led by Robert Baratheon, who then had himself crowned King, with the Targarayen’s dragons all having died out decades ago they were forced into exile. Robert's closest friend was Eddard Stark, the lord of the icy northern half of the continent, and in the early stages of the series it is Eddard who appears to be the main character. After King Robert's closest advisor dies in mysterious circumstances, Robert rides to Eddard's castle to ask him to replace the advisor, and incidentally take over much of the running of the Kingdom. Eddard, not interested in the additional power of the role he is offered is initially reluctant to leave his family and home, but eventually agrees, to a large extent because he wants to keep an eye on the King's in-laws, the Lannister family who betrayed the Targarayen Kings, and have a reputation for ruthlessness and greed. After his young son Bran is severely injured after apparently falling from the Castle Walls (with a bit of help from one of the Lannisters after accidentally witnessing something he shouldn't have seen) and is then the target of an assassination attempt, Eddard suspects the Lannisters are responsible for his son's injury but has no proof to accuse them since Bran can't remember how he came to fall. After a covert message from the King's dead adviser's widow suggests that the Lannisters may have been behind the adviser's death, Eddard decides he has no choice but to take up the offered position and get involved in the murky politics of court in an attempt to find out the truth. When Eddard arrives in the capital with his family he finds that his notions of honour and duty make him poorly suited to deal with the labyrinthine politics of the Kingdom's capital. With few allies in the South he finds himself largely isolated. Eventually the whole situation breaks down into a bloody civil war in the second and third books, with several different forces claiming the throne. This is where most of the plot threads, and most of the characters are concentrated – but events elsewhere may have a big impact later on in the series. Eddard is one of several “point of view” characters used in the series, each chapter is told from one character’s point of view. In the south as well as Eddard there are a number of other point of view characters. Eddard’s daughters Sansa and Arya both get their own set of chapters. Teenage Sansa is excited about going to court, she is naïve and has a fondness for romantic stories so she doesn’t realise the corruption of the nobility or the unsuitability of the petulant and cruel teenage Prince Joffrey, the King’s eldest son, who Sansa is determined to marry. Her younger sister Arya is more headstrong, more wordly and very reluctant to do what she is told. Initially their role in the series is merely to provide differing viewpoints on the machinations at the court, but they later become more closely involved in events at the Kingdom begins to break down. Eddard’s wife Catelyn also gets her own chapters. After a message from her sister (wife of the murdered adviser to the King) warning of a conspiracy at court she travels south separately from her husband and the King’s party to investigate things for herself. Her son Bran, crippled after injuries sustained in his fall, is left in the North and is the final Stark point of view character, observing his family’s land’s preparations for war as the situation in the South deteriorates. There are also three point-of-view characters from the Stark’s main rivals, the Lannister family. Queen Cersei, a reluctant bride to a King she feels doesn’t respect her is continually trying to ruthlessly manipulate everyone around her for her family’s and children’s advantage. Her twin brother Jaime, a member of the King’s personal bodyguard and infamous for having treacherously killed the last Targarayen King is more loyal to his family than the King he supposedly serves. Their younger brother Tyrion, is the black sheep of the family, his serious disabilities lead to him to be nicknamed ‘the Imp’ by his fellow nobles and he is held in contempt by his father, his sister and most of the rest of the nobility despite being clearly the most intelligent and cunning of the Lannister siblings. Although the Lannisters are, to a large extent, the villains of the series, Martin still succeeds in showing that from their point of view what they do is sometimes justified and Tyrion is arguably one of the heroes of the series despite being on the same side as most of the series’ antagonists. Another plot thread follows Eddard's illegitimate teenage son, Jon Snow. Faced with his stepmother's hostility, he leaves home to join the Night's Watch – an army of men who guard the Northern frontier of the kingdom, from behind a giant wall of stone and ice. He finds it difficult to adjust to the Watch's harsh lifestyle and attitudes, but there are more serious difficulties ahead as sightings of the walking dead are reported in the wild lands beyond the Wall. Although the “Others”, beings who once controlled the whole continent with their armies of undead are widely believed to be merely ancient myths, the isolated men of the Night’s Watch soon discover that they were anything but stories, and with the rest of the country falling into Civil War they’ll have to hold the Northern frontier as best they can. The final plot thread follows the two surviving members of the Targarayen dynasty, in exile on a distant continent. Viserys Targarayen is the notional heir, and he is determined to reclaim the kingdom for his family, to achieve this he marries off his teenage sister Danerys (the main character in the plot thread) to the leader of the Dothraki, a nomadic tribe of warriors, who he thinks will help him reclaim his crown. However, the Dothraki have their own plans, and Danerys finds herself more willing to go along with them than her cruel elder brother. After being given a gift of supposedly fossilised dragon’s eggs she realises if she can hatch them, she may be able to regain her family’s Kingdom. In later books additional point-of-view characters including female knight Brienne, smuggler-turned-noble Davos and intelligent but overweight and pampered Night’s Watch recruit Sam (exiled by his noble father, disapproving of his son’s weakness as a heir) are added to the story providing additional perspectives on the plot. The initial premise is reasonably straightforward, but things quickly get more convoluted in each of the plot threads, every character (and there are a lot of characters) has their own agenda and their own motivations. Martin also has a liking for sudden (and generally violent) plot twists, including a few surprising deaths of seemingly major characters – even though there is some foreshadowing, there are bound to be a few surprises for even the most alert reader. At times it can be difficult to keep track of every small event, but Martin does a good job of highlighting the major plot points. Martin has an efficient writing style that manages to convey all the important details and nuances of a situation without wasting time on excessive description (unlike some other epic fantasy authors, such as Robert Jordan) so the books are generally quite fast moving. Despite this, the sheer amount of story means that all four volumes published so far have been approaching the 1000-page mark. Martin's characters are well thought out, and their motivations are convincing. 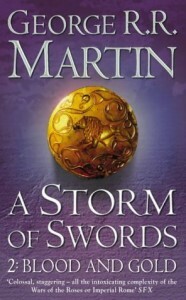 This is not one of those books where good triumphs over evil by default, even if a character acts with the best of intentions there is still a strong chance of things going horribly wrong, the best example being Eddard's attempts to apply his own personal code of honour and integrity to life whilst getting involved in court politics, with disastrous consequences. Most of the characters can't be neatly divided into 'good' or 'evil' categories, his heroes tend to be flawed in some way and most of villains either aren't so villainous from their perspective, or at least have some redeeming features, for example Jaime Lannister initially seems like a straightforward villain but when things are shown from his viewpoint in the later books his motivations for some of his villainous actions do make them more understandable, even if they don't make them entirely justified. Despite the complexity of the story, there were few signs in the first three books of control of the plot getting away from Martin. 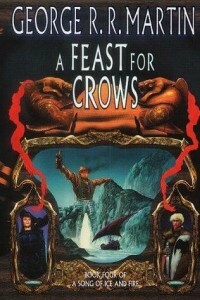 However, the fourth book, A Feast For Crows was, while still being good, a comparative disappointment as the pace of the plot slowed significantly and only small steps were made towards the main story arcs being resolved. The extended wait for book 5, "A Dance With Dragons", which is currently several years behind schedule has also raised concerns about how long it will take for the series (predicted to be seven books long) to be finished. The slow rate of publication is the only major weakness in Martin's writing. There isn't really a single factor that has made Martin's series one of the most acclaimed Fantasy series of all time, instead its popularity is probably due to it doing many things well. The plot is compelling, original and often surprising. It is by turns thrilling, touching, shocking, intriguing, thoughtful and exciting, and it is consistently entertaining throughout. It features vivid and memorable characterisation and a fascinating, convincing and highly detailed world. Even in its current, unfinished, state “A Song Of Ice And Fire” is a very impressive, superbly written, work of fantasy that stands as one of the best pieces of work in its genre. 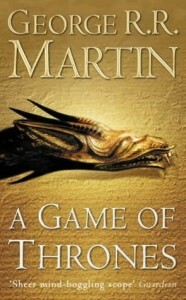 The fifth book, A Dance With Dragons will hopefully appear in 2011, although a release date has yet to be confirmed. 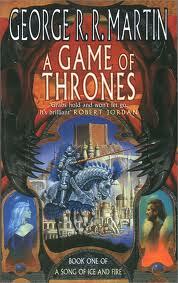 2011 will also see the first season of HBO's TV adaptation of the series, retitled "A Game of Thrones".